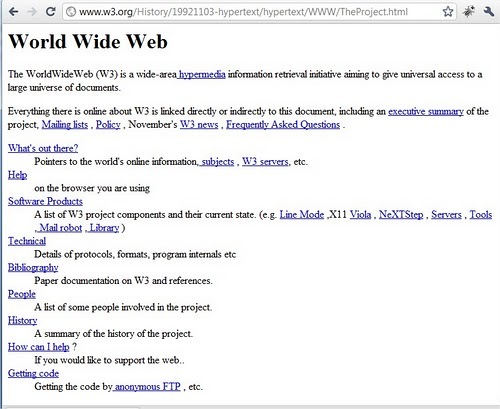 The first ever web page, created by Sir Tim Berners Lee to explain, naturally, the WWW. This week marks the beginning of a journey I’m taking to understand “deep linking” in mobile. I’ve kept one eye on the space for some time, but it’s clearly heating up. Last Spring three major mobile players – Facebook, Google, and Apple – all announced significant developments in deep linking. Twitter has also fortified its deep linking capabilities of late, as has Yahoo. Most of these major players are supporting deep linking for commercial reasons – their business is driven by advertising, and a huge cut of mobile advertising revenues are in turn driven by app installs. Marketers want to be able to link directly to specific places inside their apps, so they can drive qualified leads to convert (and measure effectiveness/optimize campaigns). To be clear, these are the ads that show up inside apps on your mobile phone encouraging you to download a free game or service. These install ads make up a huge percentage of mobile advertising revenue, though it’s hard to find hard figures for exactly what percentage. Current estimates range between 30 and 50% – either way, that makes them the largest category of mobile advertising, period. This all reminds me of how search played out on the desktop Web – search was a huge percentage of overall “online advertising” revenues in the early days, but it took a while before analysts started breaking search out as a category independent of “online advertising.” Twenty years into search, that category still represents more than 40% of all online ad revenues. So yep, I’m watching deep linking, because I think there’s a big there there. But there’s a funny hitch to the evolution of linking inside our mobile ecosystem. On the Web, the link is pretty much the atomic unit of value – from the get go, *anyone* could create a link from one web page to another. The web was built on links, and in the early days those links were built, for the most part, by *users* of the web – people like you and me. We built link-heavy websites, we blogged and linked profusely, we emailed links around, and in doing so we connected static web pages one to another, all in the name of navigation, discovery, and ease of use. It was only later, as search rose to prominence and people started to realize the commercial value of links, that the SEO industry became a commercial monster. In short, linking behavior predated commercial exploitation. …while developer-driven deep links are great, the next step in mobile won’t really take off until average folks like you and I can easily create and share our own links within apps. Once the “consumers” start creating links, mobile will finally break out of this ridiculous pre-web phase it’s been stuck in for the past seven or so years, and we’ll see a mobile web worthy of its potential. I imagine a time when applications encourage their users to share links from inside apps, and everyone finds that sharing behavior will create a positive feedback loop similar to the one that drove the rise of the original Web. From there, any number of innovations will arise, speculating on what those might be is worthy of several future posts. For now, I’ve come across a crop of startups focusing on deep linking as well various industry efforts in the field (I have Semil Shah and Roy Bahat, among others, to thank for my early lessons in the space). In the coming weeks, I’m meeting with many of them, including URX, Kahuna, Deeplink, Appboy and several stealth startups, and of course larger players like Twitter. As I get smart, and if I find interesting stuff, I’ll report back here. In the meantime, if you’ve got any suggestions for me, please leave them in comments or ping me on Twitter. Thanks! I agree that it needs mainstream adoption to take off. But the bottleneck isn’t the linking per se. Today we know BBC.com/foo/bar will take us there. Bbc’s deep link schema ie The BBC in BBC://foo/bar. Yes. Deep linking looks quite promising while the mobile search is fast emerging as an effective alternative to desktop search. It’s still at a nascent stage as over 60% of the websites are yet to adopt a mobile-friendly version of their websites or build a smart phone app for that matter. Google is trying hard to capitalize on this emerging trend by introducing several things, which is plausible from the way it has thrown a warning at the Webmasters about the redirected links on their mobile sites. Plus they have removed the profile photos from the authorship on SERPs. These are all indicative of the fact that Google has already started working its way towards to dominate the mobile web and deep linking.